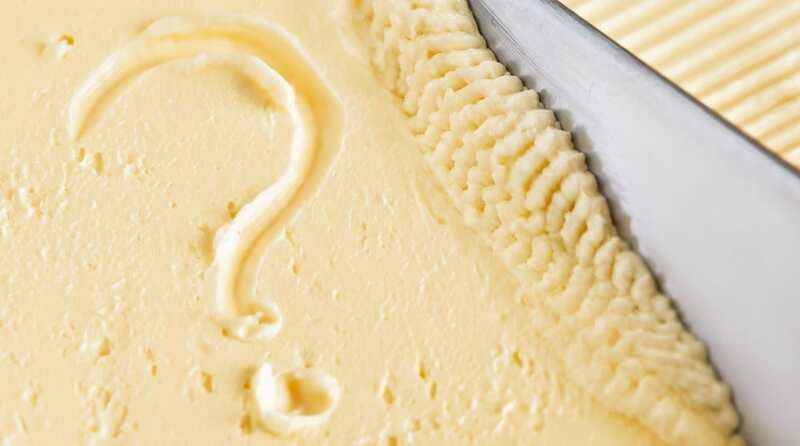 What Is Margarine and Why It Is Not the Healthy Choice? Of all the unhealthy products created as processed supermarket foods took over in our diets, margarine must be one of the worst and quite possibly the strangest and most bizarre in it’s manufacturing process. Here’s why you’ll hopefully go to your fridge right after reading this article, throw that tub of margarine in the bin and never buy it again. What is margarine exactly and how is it made? To make margarine and the vegetable shortening that is used in huge variety of supermarket foods, the chemical factory starts with vegetable oils extracted from soybeans, corn, cotton seeds or canola under high heat and pressure and with toxic solvents like hexane. The foul-smelling oil is then treated with acids and caustic soda and bleached for the first time to minimize the very unappetizing shade of dark gray it starts out as. A second high temperature deodorizeration process destroys anything resembling nutrition in the oil and increases the likelihood of it becoming completely rancid. Next the oil is blended with a nickel catalyst and hydrogen gas in a high pressure reactor. This forces the hydrogen atoms into the fatty acid molecules, making them solid rather than liquid at room temperature. This process is known as hydrogenation and leads to the creation of toxic trans fats, strongly linked to cardiovascular disease. From the high pressure reactor, the noxious smelling grey grease that results is filtered to remove the nickel, mixed with emulsifiers and high-temperature steam cleaned yet again. Because no one in their right mind would eat this grey sludge if they could see it as it’s produced, the manufacturers then bleach it again and add artificial flavors, synthetic vitamins and the yellow color to help it masquerade as butter. So that’s how margarine is made. The question is, why on earth would we eat something like this? No animal, bird or insect will touch it. Even ants and flies avoid it and yet we’ve somehow been convinced that margarine is the healthy choice. Very little could be further from the truth. That this dangerous ‘food’ is actually still recommended as ‘heart healthy’ is a testament to how little regard certain foundations have for current medical research, or even basic common sense when sponsorship dollars are involved. Butter from cows grazing on grass rather than being fed corn waste from ethanol production is far and away the healthiest type of butter. While it is becoming more popular, you might still have to go to a large health food store or specialty deli to find it. If you can it’s worth stocking up for consistent supply. Grass fed butter is particularly rich in fat soluble nutrition such as vitamin A, vitamin D, vitamin E and vitamin K. It also helps with the absorption of other fat-soluble nutrients like pro-vitamin A carotenoids in vegetables. Conjugated linoleic acid (CLA) is a nutrient that is been shown to aid in weight loss and grass fed butter is considered one of the best sources of it. Other beneficial fatty acids such as lauric acid, glycosphingolipids and omega-3 fats are all found in natural grass fed butter and, on balance, are far and away more important than any concerns about a few extra calories. Healthy natural foods like grass fed butter can heal and nourish our bodies. The toxic gray sludge that comes out of the margarine chemical plant is now being linked to chronic illnesses like arthritis, Alzheimer’s and cancer. Replacing saturated fats like butter with polyunsaturates like margarine has also recently been shown to increase the risk of coronary heart disease. Margarine the healthy choice? I really don’t think so. Did you know how the margarine you’ve been spreading on your bread is made? Now that you do could you still eat it? I’d really like to hear what you think about unhealthy products created like this being called food in the first place and then sold to us as healthy. Is There a Better Butter? Hi Temilola and thanks for your comment. I’m still amazed that food companies were able to market something made in this way as healthy but I think the word is finally starting to get out. I’m the same but I doubt many people know just how this stuff is made, and I’d be interested to see if they’d still eat it if they did. Hi Christine and thanks for the info. Yet another reason not to eat margarine. I really wonder how many people would if they knew how it was made. Be nice to see more doctors aware of the effect of chemical additives as well. As an immigrant child in Canada in the Fifties, I had the delightful job of stripping out the bright orange coloring packet for each new supply of margarine that arrived at the house. The little octagonal package, about two inches across, held a magical bright powder that turned the sickly white block of grease into something that resembled butter. Heaven forbid you should get any of that powder on your clothes–it proved ineradicable by even the most earnest Dutch housewife! Butter itself came with similar coloring packages in the winter, when butter is naturally whiter than in the summer. That practice became unpopular at some point in history; now butter is always the same color although green grass is not a constant. Something wrong there. Now I mostly use an avocado to butter my sprouted-grain bread. Meal in a bite. I grew up hating margarine and abandoned it for butter at the earliest opportunity. Hi Eva and thanks for the insight. Think this is all done in the large chemical factory now but the ineradicable colorings may well be the similar. Wonder if they’re as difficult for your body to remove internally. I agree that avocado is an even more health option than butter, but like you I’ll always avoid those sticky blocks of margarine grease they label the ‘healthy choice’. Ugh! I was looking for cookie recipes containing margarine and came across this site by mere accident and well, now I’m glad I did. I don’t think I want to eat margarine anymore. I’ve always loved butter, but because I’m on low income disability I’ve been forced to use margarine instead. However, after reading the entire process of how it’s made, I almost puked. I have heart disease and I’m supposed to believe that margarine is healthier for me? I think NOT! I’ve left some out on the counter a few times and I notice flies coming around and checking it out but they don’t eat it….ever. I mean hell, if a fly won’t go near margarine, something is really wrong with that stuff. Flies eat anything. They’re trying to tell us something here and we’re not even listening to them. Isn’t it amazing how we get sucked into things on massive scales?! Kinda like that “magical man that lives in the sky” delusion. pfft! Btw is olive spread just as bad?